ITER, our agent-based computational model for interdomain network formation (joint work with Constantine Dovrolis at Georgia Tech) published at CoNEXT 2010, accounts for many real-world effects such as transit and peering prices, geography, interdomain traffic patterns, and provider/peer selection strategies used by networks. Given a set of input parameters — network population, traffic patterns, pricing/cost structures, geographic constraints — ITER computes an equilibrium, where each network connects to the best set of providers and peers according to its chosen interconnection strategy. We parameterized two instances of the model using recently reported trends in interdomain traffic patterns, geographic expansion by large content providers, and the peering openness of transit providers. We then computed the interdomain connectivity and fitness for both networked ecosystems at equilibrium, and compared their topologies, traffic flow, and profitability of different network types. The first instance reflects a traditional (textbook) view of the Internet, where traffic originates at the edge of the Internet, passes “upstream” through one or more regional (tier-2 or tier-3) networks before reaching a tier-1 network backbone. These (approximately ten) tier-1 backbone networks exchange traffic as settlement-free peers (i.e., for free) across the globe, handing traffic off to regional providers for “downstream” delivery to its final destination. Conceptually, traffic flows hierarchically, from content providers or stub networks up to the tier-1s at the top of the hierarchy, and back down to the consumer. The second instance reflects the emergence of large content providers like Google, Akamai and Facebook, companies that have taken advantage of lower bandwidth prices by building their own global private networks. Our ITER model predicts that as these large content providers expand their geographic scope and accessibility to possible network peers, traffic patterns will evolve to bypass tier-1 networks, instead flowing directly from the providers of content to its destination(s). Less traffic through tier-1 networks implies lower profits, eventually losses, and ultimately mergers, acquisitions, and/or bankruptcies. Some large ISPs are in a position to save themselves from the unprofitable world of pure bit carriage by providing higher margin over-the-top services such as on-demand content, multi-site VPNs, and cloud/hosting/CDNs. As an example, Level3 has aggressively marketed a CDN offering, with Netflix as one of their recent high-profile customers. Similarly, most large transit providers such as AT&T, Verizon and Sprint have already begun vertical integration and bundling of residential broadband, wireless, and content services. Our model also predicts that tier-1 providers can restore some of the revenue from lost transit traffic by entering into settlement-free peering agreements with large content providers, inducing additional traffic to their own customer networks where pricing by traffic volume tends to be standard. Such a move would require tier-1 ISPs to relax their traditionally restrictive peering policies — behavior that would be interesting to observe in publicly available BGP data over the next year. Were the two recent acquisitions — CenturyLink and Savvis, and Level3 and GlobalCrossing — predictable based on publicly available financial and routing system data? We examined recent financial data reported by the companies in SEC filings, as well as publicly observable BGP peering data for the last 10 years (more about this data in our paper published at the IEEE/ACM Transactions on Networking). 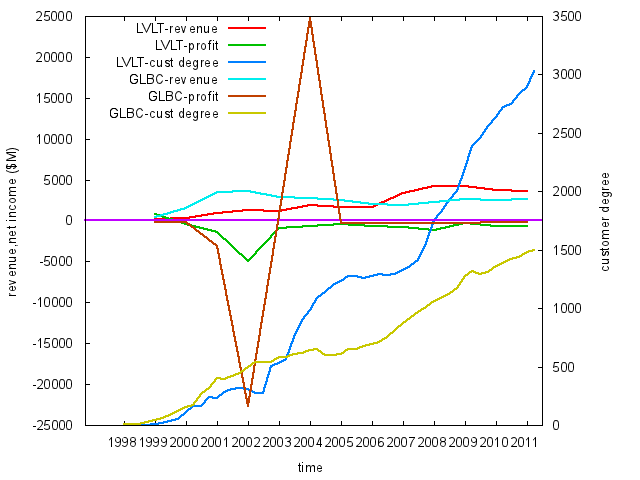 The graph below plots the revenue, profit, and number of (BGP-based estimated) AS customers of Level3 and Global Crossing over the last few years. While the customer bases of both networks have steadily grown over the last decade, revenue and net income numbers for both have been flat, particularly in the last 4-5 years. From a financial perspective, Level3’s acquisition of GlobalCrossing looks like a strange merger between two long-unprofitable companies. 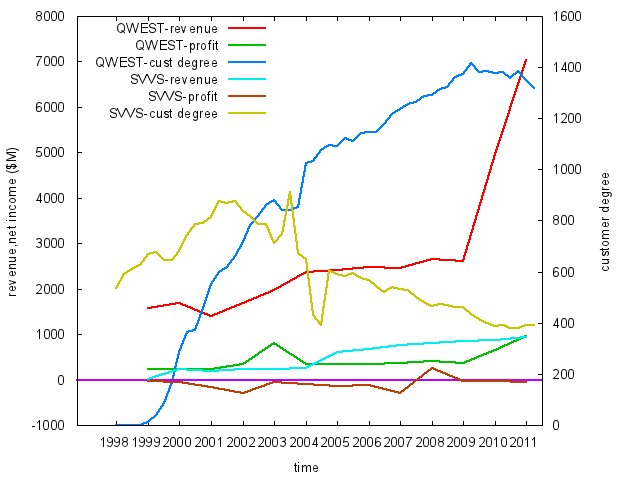 The financials of the second deal, between Qwest (Centurylink) and Savvis, are more understandable. The graph below shows that Centurylink has been profitable over the last 5 years, with tremendous revenue jumps in the last two years, during which its BGP-observable customer base has slightly decreased. But SAVVIS’s customer base has been in steady decline since 2001, from around 800 AS customers in 2002 to about 400 in 2011. Even though revenue has been growing, the company has turned a profit only once in the last decade. Both the financial and routing data suggests that Centurylink’s acquisition of Savvis is a reasonable strategy. Based on ITER’s prediction that tier-1 ISPs are in trouble, we can go a step further and examine trends in financial and routing data of some top 20 transit providers to predict which one might fall next. 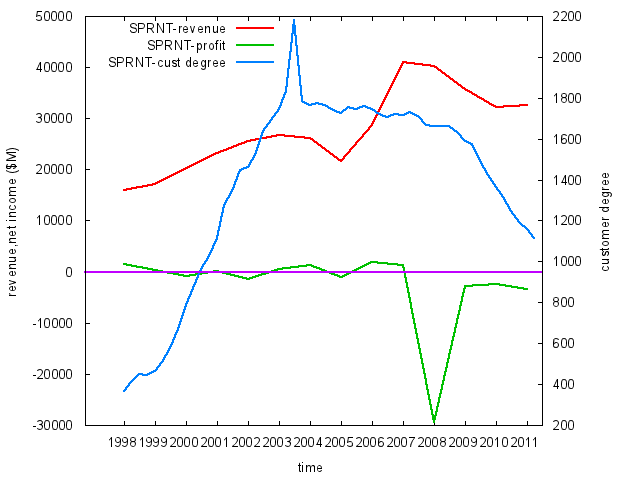 The graph below shows that Sprint has not been profitable since 2007. Moreover, while other large ISPs such as AT&T, Level3 and Cogent have been steadily acquiring AS customers over the last few years, Sprint’s AS customer count has slowly decreased from around 1500 in 2003 to about 1100 in 2011. AT&T’s proposed acquisition of T-mobile will further deplete Sprint’s revenues in the wireless market. Based on the publicly available financial and routing data, we believe Sprint will be the next tier-1 to go. This entry was posted on Friday, July 15th, 2011 at 6:24 pm	and is filed under Commentaries, Economics, Policy, Topology. You can follow any responses to this entry through the RSS 2.0 feed. You can skip to the end and leave a response. Pinging is currently not allowed.